Following the massive success of its first season, the second season of Satyamev Jayate, hosted again by Aamir Khan, premiered on 2nd March, in various languages as well as on Doordarshan. The social media campaign of Satyamev Jayate, just like the show, aims to educate the masses about the many aspects of the society they’re unaware of. 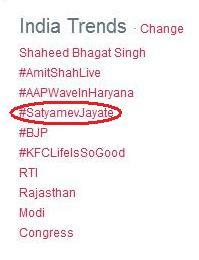 Satyamev Jayate has an official Facebook page, Twitter handle, Youtube channel and an official website. To initiate people’s participation and to educate them about the social issues that prevail in the country through social media platforms and various channels within the Star Network. The show used all the social media platforms to the fullest. The show unfailingly trended every Sunday on Twitter, just the way it used to in its first season. 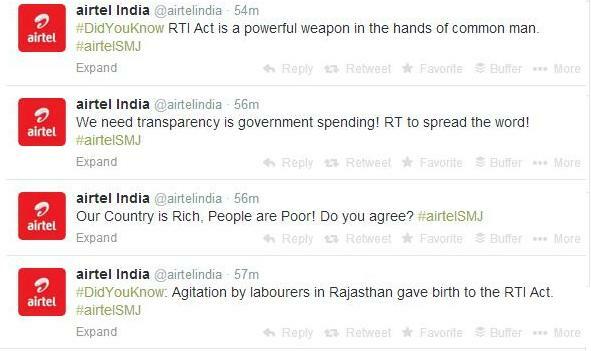 Real time tweets were made by the Twitter handle of Satyamev Jayate, Star Plus and Airtel. The tweets continued to be shared in the week that followed the episode when it was aired. Tweets included links to the Youtube channel and the website along with the posting of interactive images and snippets from the episode that was aired. The twitter handle currently has 1,84,513 followers. As far as Facebook is concerned, the page currently boasts of 3.7 million likes. Apart from daily updates, the page has a ‘Donate Now- Axis Bank’ tab through which the user can make a donation to the cause they’d like to support. Another tab is the ‘Airtel Satyamev Jayate: My Voice’ app where the users can watch the episodes on the page itself. The page has videos, snippets from the show, a Notes section and a ‘Vote for your favourite song’ tab. The page also regularly shares information related to the various issues that have been discussed on the show. The most powerful social media platform used by the show is their website. The website has profiles of the NGOs that the show intends to gather support for. Another section on the website is ‘Empower yourself’, the most educative and informative section that covers all the possible information about the issues that the show brings to light. Needless to say, the website also allows people to make donations. The show makes amazing use of social media to provide the viewers with a host of information, allowing them to be a part of the change. It has also substantially eased the process of making donations. It has been instrumental in bringing attention to the various NGOs that work towards the betterment of the society. The consistent sharing of Youtube links allows people to catch the episodes they’d missed, especially since the show has a rather unusual airtime. The use of hashtags such as, #IStandForIndia, #SatyamevJayate and other hashtags relevant to the themes of the episodes to engage the audience. The social media campaign of Satyamev Jayate has the potential to become more interactive by introducing Google+ hangouts wherein the host, Aamir Khan can have live interactive sessions with experts. Buzz can be created on social media about the hangout sessions to bring in maximum audience participation. Although the website shares information about the NGOs, the same can be shared on Facebook and Twitter as well. The interest of the audience can be utilised by asking them to send in their experiences, poems, videos and photos. The notable ones can also be featured in the episodes. As we look forward to the 2nd half of Season 2, we can only look forward to it taking all social networks and the idiot box by storm. 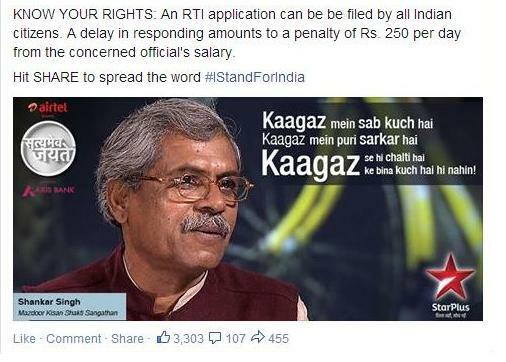 Satyamev Jayate is already using social media at its best to bring the various social causes to light and at the same time enabling people to make a difference by simply making a click on their computer screens. Introduction of a few more outlets and options for people to voice their opinions can make the social media campaign as revolutionary as the show. Shikha is a social media enthusiast, writer and a workaholic who lives on coffee. She enjoys watching her favourite sitcoms, stand-up comedy acts and also speaking her mind on Twitter under the guise of @BawlaChawla.